Wincache is PHP extension that Microsoft® wrote to improve the performance of PHP applications on Windows-based platforms. All Web Hosting Windows accounts have access to the performance-enhancing power of Wincache, but it's disabled by default. You can find out more about how Wincache works by visiting PHP.net. Note: This setting affects all PHP scripts on the hosting account. Enabling it might interfere with other applications you have installed. Save this file to the root of your website and then browse to yourdomain.com/phpinfo.php. 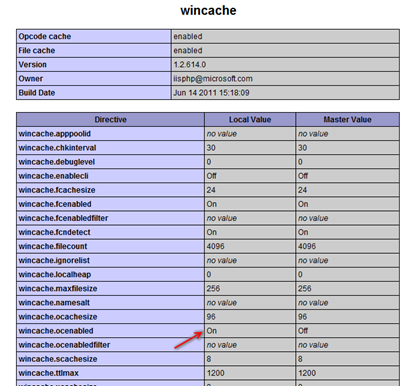 The wincache.ocenabled parameter display as On for the local value. Hvorfor vises mit website ikke korrekt? Hvor mange filer kan en hostingmappe indeholde?